I’m not at HR Tech this year, but am following the proceedings on Twitter (#hrtechconf). As always, there’s lots of chatter about what’s the next big thing in human capital management technology. Cloud, Big Data, Mobile, and Social capabilities abound among the industry darlings. Everybody loves a winner and it’s fun to work for those winners. Your friends will think you’re both smart and lucky. Until your employer’s once bright star begins to fade, that is. 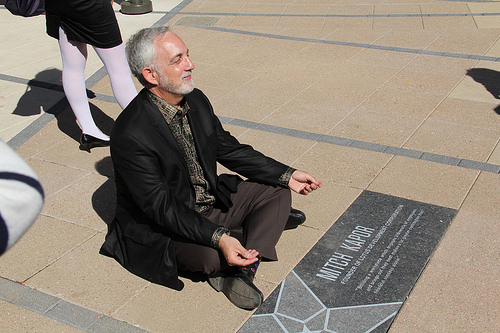 Pictured above left is Mitch Kapor, the founder of Lotus Development. Mitch was a wunderkind in the Massachusetts tech industry, and the picture here is of him receiving his Entrepreneur Walk of Fame award in 2011. I worked at Lotus from 1992-1999. In 1995, IBM snapped us up, eager to get their sticky blue fingers on Lotus Notes. Fast forward almost 20 years, and the image on the right above is making fun of those poor non-profits that can’t afford to move to a more contemporary platform. In the early 80’s through the late 90’s, there was no better tech company to work for. Lotus was the Google of its day. How come? Because taking spreadsheets off of paper and into computers solved a huge productivity challenge around the world. And then came Lotus Notes, the first collaboration platform of its kind. It was a huge step forward in business computing, and also an idea before its time. Notes was revolutionary, but people didn’t understand how online collaboration could fuel further advances in productivity. Notes still exists as an IBM product, but lost it’s preeminent position in collaborative computing right around the time we were all getting over the Y2K scare. How come? There was a bit too much innovation for the sake of innovation. The software became increasingly bloated and difficult to configure. Customers turned to lighter weight solutions that weren’t so costly to implement and maintain. So what’s the lesson for the darlings of the tech world in 2013? Keep that innovation coming, but make sure you can explain what the innovation does for your customer. If they don’t buy the explanation, they’re not going to be buying the solution either. Watch the short 1983 Lotus promotional video below. It will remind you that innovation is timeless, even if shoulder pads aren’t. Previous Previous post: Non-Essential Employees – Who Makes That Call?